Although asphalt is a durable and budget-friendly material for a parking lot, it can break down over time if not properly maintained. To keep yours in the best shape possible as long as possible, it’s important to make upkeep a priority. A clean, undamaged asphalt parking lot attracts customers and boosts the curb appeal of your business. On the other hand, if your parking lot is cracked and riddled with potholes, guests will get the wrong impression. Address Drainage Problems: Cracks typically form in an asphalt parking lot when water doesn’t drain away from it quickly enough. Water seeps into small, existing cracks, eroding them further. This is an especially major problem in winter. If water leaks into a crack and temperatures drop below freezing, the water will turn into ice and expand. When it does, it pushes the pavement out along with it. As temperatures rise again, the ice melts and the asphalt pavement settles back down, resulting in a pothole. Prevent this by making sure your gutters and downspouts direct water away from your asphalt parking lot. If you notice pooling water after heavy rain, you may need to install additional drains. Remove Debris: Once a week, have an employee sweep away any debris that has accumulated on your lot. Doing so serves two purposes. First, it improves the look of your asphalt, making your business more appealing to customers. More importantly, if enough debris accumulates on an asphalt parking lot, it can prevent water from draining away quickly. You want to remove all debris before it gets to this point. Keep Weeds in Check: If you see weeds growing around or through your asphalt, remove them immediately. Weeds have strong roots, and even if they look small at first, they can grow straight through your asphalt over time, resulting in cracks that you’ll have to repair. Install Speed Limit Signs & Barriers: When drivers speed or make sharp turns, it can easily damage your asphalt parking lot. Limit the potential damage by installing signs reminding drivers not to speed. You can further protect your asphalt with speed bumps and cement barriers to promote slower driving. 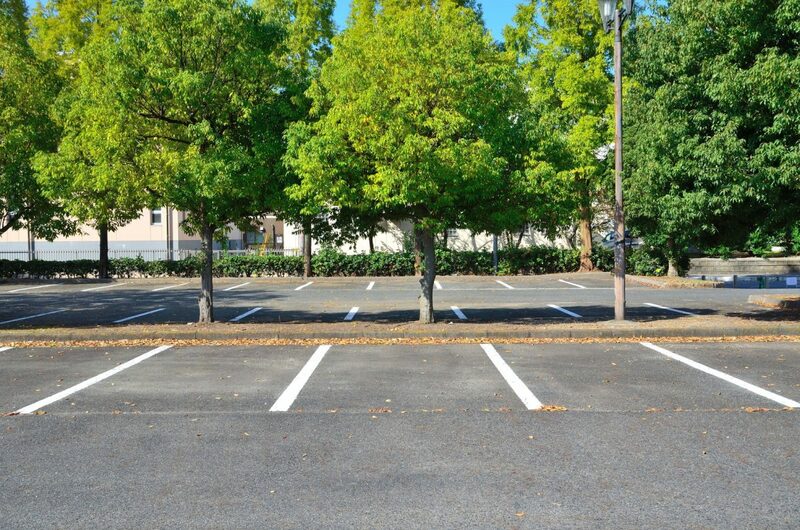 Make sure all stripes and arrows on your lot are clearly visible, as people are generally less likely to drive carelessly throughout a parking lot when they have clear markings directing them. Inspect: At least once a month, conduct a basic visual inspection of your asphalt parking lot for any signs of damage, including cracks, potholes, and oil stains. While you may be tempted to address them on your own, doing so could cause additional damage if you’re not careful. Instead, if you do notice any issues, get in touch with an asphalt repair company. They’ll have the tools, knowledge, and experience necessary to deliver quality results. Your parking lot affects how customers think about your business. By following these tips and consulting with reliable paving contractors, you’ll have a lot less trouble keeping it in good shape.